Q88. 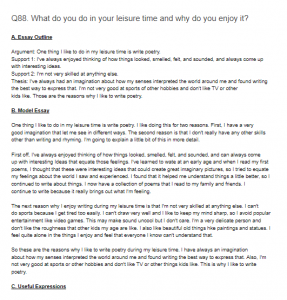 What do you do in your leisure time and why do you enjoy it? Argument: One thing I like to do in my leisure time is write poetry. Support 1: I’ve always enjoyed thinking of how things looked, smelled, felt, and sounded, and always come up with interesting ideas. Support 2: I’m not very skilled at anything else. Thesis: I’ve always had an imagination about how my senses interpreted the world around me and found writing the best way to express that. I’m not very good at sports of other hobbies and don’t like TV or other kids like. Those are the reasons why I like to write poetry. One thing I like to do in my leisure time is write poetry. I like doing this for two reasons. First, I have a very good imagination that let me see in different ways. The second reason is that I don’t really have any other skills other than writing and rhyming. I’m going to explain a little bit of this in more detail. First off, I’ve always enjoyed thinking of how things looked, smelled, felt, and sounded, and can always come up with interesting Ideas that equate those feelings. I’ve learned to wate at an early age and when I read my first poems, I thought that these were interesting ideas that could create great imaginary pictures, so I tried to equate my feelings about the world I saw and experienced. I found that it helped me understand things a little better, so I continued to write about things. I now have a collection of poems that I read to my family and friends. I continue to write because it really brings out what I’m feeling. The next reason why I enjoy writing during my leisure time is that I’m not very skilled at anything else. I can’t do sports because I get tired too easily. I can’t draw very well and I like to keep my mind sharp, so I avoid popular entertainment like video games. This may make sound uncool but I don’t care. I’m a very delicate person and don’t like the roughness that other kids my age are like. I also like beautiful old things hke paintings and statues. I feel quite alone in the things I enjoy and feel that everyone I know can’t understand that. So these are the reasons why I like to write poetry during my leisure time. I have always an imagination about how my senses interpreted the world around me and found writing the best way to express that. Also, I’m not very good at sports or other hobbies and don’t like TV or other things kids like. This is why I like to write poetry.